Unfortunately this gift voucher offer has now sold out. 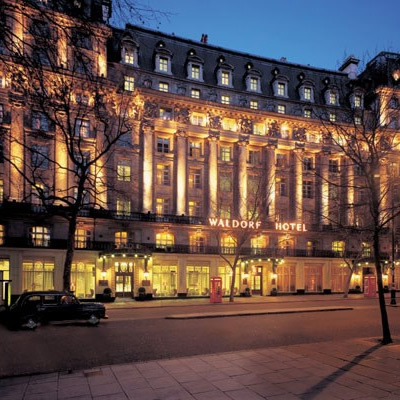 Dating back to 1908, the 5-star Waldorf Hilton in London is packed with history and charm for everyone to enjoy. Located in a palatial building, the upscale hotel once welcomed the likes of Dame Judi Dench and Elizabeth Taylor through its doors. Sit back and relax in the hotel’s onsite Homage Restaurant as you and your guest devour a luxurious traditional English afternoon tea for two complete with a glass of Mumm Champagne each. Satisfy those taste buds with finger sandwiches, fresh scones and buttery pastries which will be served on handmade crockery from the first-class Royal Crown Derby. A harpist usually performs at the venue so enjoy a delightful performance throughout the afternoon. What are you waiting for? Spoil yourselves! On most occasions a harpist will play as you indulge and you'll be able to use handmade crockery from Royal Crown Derby, who also supply Buckingham Palace! Please note that prices are subject to change. Please ensure that you check the price and terms and conditions on the partner website before purchase. If you find any discrepancy in our pricing then please drop us an email at hello@afternoonteagiftvouchers.co.uk.